At an early age, I knew in my heart that I was meant to live in a rural setting. When I was young, I felt very comfortable with wide open spaces, the earthy smells of trees in the woods, that down home feeling of a barn and playful interaction with animals. In my personal experience, I have cared for a wide range of furry and feathered friends; from fish, birds, hamsters & gerbils; to cats, dogs and a 14 hand Morgan horse. I brought home a baby chick once and he ended up helping me re-enact my dream…in turning our tiny inner city backyard into my own little mini-farm. I had cornstalks growing up all over and I felt like a queen! Our back porch transformed into a stall for my handsome rooster named “Yacky” and the seed was sown. I HAD to have a place where I could be who I was at my core, love what I do and encourage others to do the same! It’s important, especially in these times we are living, to be able to have that solace, that place that lights you up. Whether it be a feeling for now, or a full blown dream you envision coming true in real time and life, it is imperative that you honor that part of yourself. For me it was country living, surrounding myself with beings that help me be me; furry, feathered, “wet pets”…didn’t matter. I loved them all. But for you? What are you passionate about? Where does it feel like “home”? 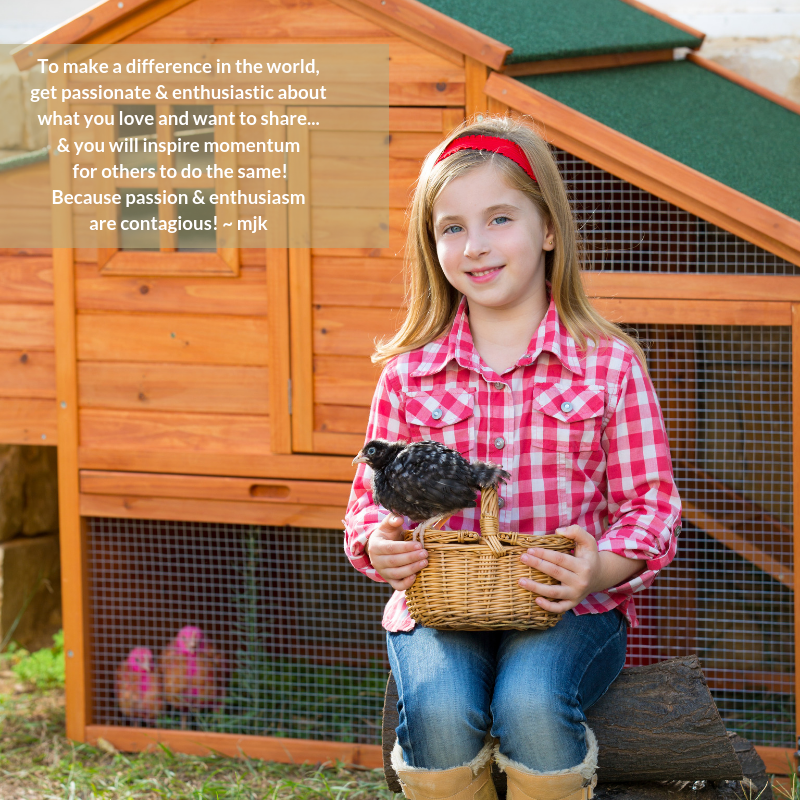 This is what Ladybug Junction Farm is all about! Are you living passionately and enthusiastically doing something you love? Let us help you go for your dreams! Sometimes you just need to brainstorm with someone who understands what it’s like to have a dream that family and friends can’t see! Our dream for Ladybug Junction Farm looks out of reach for most people we know. But we aren’t “most people”. This dream is a CALLING for us and that’s what makes the difference! What is a “calling”? It is that “thing” that keeps coming up time and time again and won’t let go of you. It feels natural, familiar and like “coming home”. If your dream feels like “coming home”…let’s chat! CLICK HERE Here to learn more about our free 15 min Discovery Session! Let’s create some passion & enthusiasm around your ideas and watch the momentum grow! The more momentum, the faster and more productive your inspired action! If now is not the time, that’s okay. I know what it’s like to not be ready to confide in others. I understand! It’s your baby! When you are ready, I’ll be here. In the meantime, “don’t give up on your dream”! « Are You Chasing Ladybugs?